You’re typically told to eat less and move more to lose weight. But if you eat too little, you'll face a metabolic slowdown that interferes with weight management. Eating enough calories at predictable intervals will help boost a metabolism that has stalled. Taking in more calories than you use in a day won't boost your metabolism, though -- it will lead to weight gain. The processes your body performs to keep you alive make up your metabolism. All of these processes -- such as breathing, pumping blood, digestion and exercising, to name a few -- are fueled by calories, which you obtain from food. People seek to boost their metabolisms so they can burn more calories in hopes of losing weight. Common weight-loss strategies call for you to reduce the number of calories you eat and increase your metabolic burn rate through more activity. Then your body burns its fat stores to make up the difference -- and you lose weight. When your metabolism is higher, it's easier to make this deficit happen. Even if you don’t want to lose weight, boosting your metabolism means you can take in more calories without gaining excess pounds. When you’re trying to lose weight, it would seem that the less you eat, the faster you’ll see results. But if you end up taking in too few calories – by following a fad diet or by skipping meals – your body may go into survival mode. In this situation, your body becomes more efficient at maintaining your basic functions because it doesn't want to waste energy. Your metabolism may slow by as much as 20 percent when you eat too few calories – usually defined as fewer than 1,200 calories for a woman or 1,800 for a man daily. You may also feel tired and lethargic, and end up burning fewer calories through exercise and other movement. Your body interprets a greatly reduced caloric intake as a possible famine, so it holds onto fat stores to increase your chances of survival. Muscle takes more calories for your body to support than fat. If your food intake is greatly reduced and you're not exercising, your body will break down muscle and use it for energy, and keep stored fat. When you lose this calorie-scorching muscle, your metabolism drops further. It's important to find the right calorie level, because eating an adequate number of calories helps keep your metabolism running near optimal levels, even as you try to lose weight. First, determine how many calories you need daily to maintain your weight. Use an online calculator that takes into account your size, age, gender and activity level. From that number, subtract 250 to 1,000 calories to get the daily intake necessary for you to lose weight at a rate of 1/2 to 2 pounds per week. If subtracting 1,000 puts you below the requisite 1,200 for a woman or 1,800 for a man, go with only a 500-calorie deficit. It means you'll lose more slowly, but you won't negatively affect your metabolism. This gradual, steady weight loss is more likely to be sustainable for the long term. Exercise along with your diet to offset the possible slowdown of your metabolism from the calorie restriction. Working out helps you hold onto muscle mass, and since muscle tissue burns more calories than fat tissue, having that muscle helps your metabolism stay revved. You also need to eat enough to feel energized for your workouts -- so if you feel like you're slogging through your exercise time with barely enough energy, you may need to increase your calorie level slightly. When you're following a calorie-controlled diet, it's a good idea to eat smaller portions more often. You may be tempted to skip meals, but try not to do it. Not only does meal-skipping create hunger that may lead you to eat too much at your next sitting, it also slows your metabolism. A small study published in a 2005 issue of the American Journal of Clinical Nutrition looked at whether meal frequency and spacing affected the post-meal metabolic rates of 10 women. When the women ate six times a day at predictable intervals, it boosted their post-meal metabolic rate more than when they ate the same number of calories at three to nine unpredictable intervals. 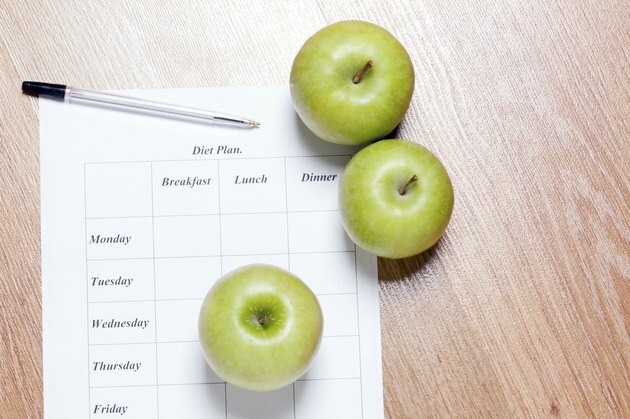 Plan to eat breakfast, lunch and dinner daily, with a smaller snack between each of the meals and just before bed. Include more lean protein at these meals too -- a total of about 0.6 grams per pound of your body weight per day, especially when you're trying to boost your metabolism and lose weight. That would be about 90 grams of protein a day for someone who weights 150 pounds. Getting enough protein increases satiety as well as dietary thermogenesis -- or the amount of calories it takes to digest a meal -- according to a review article in the Journal of the American College of Nutrition in 2004. How Many Calories Should a Woman Eat per Day to Lose Weight?